LISTEN UP… This week we are celebrating MOM! Mine, yours, you if you have littles- whosever it is- they are most likely amazing. 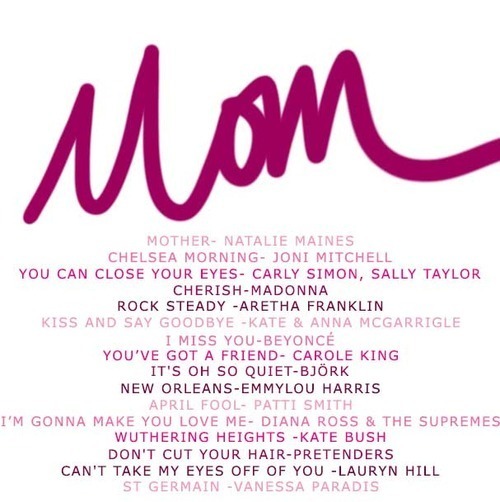 The lady singers on this week’s list are all mothers -some better than others (did you catch what mom of four Madonna wore to the Met Gala this week-cringe!) My mom favoured the long-sweeping broom skirts-phew. None of these women are as fabulous as my own mother, except maybe Beyonce. It should be noted I have a pretty cool mother-in-law as well, but the U.K. celebrates Mother’s Day in March, so Sue has already had her day! Some interesting facts about the ladies on the list Kate McGarrigle claims Rufus Wainright as a son. Vanessa Paradis has two children with just-turned-50 Johnny Depp, sadly they are no longer together. The song Don’t Cut Your Hair is an inside joke between my mom and I and I will be forever haunted by my senior picture! Have a fabulous weekend and remember to enjoy your mother! Listen to the mix on Spotify, here! You can see my cute mom here, here and here!